Have you ever wondered how many golf gloves are consumed in the United States every year? By one estimate, there are approximately 10 million golfers in the U.S. -- if each uses only TWO gloves per year, that's 20 million golf gloves. While many golfers use a single glove for years and years, others, like me, use 5-7 per year. Whatever method you use to figure it, it's a lot of gloves. 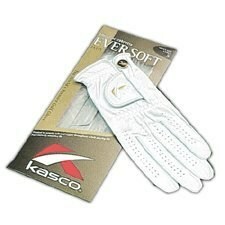 One entry in this category is the Kasco Ever Soft golf glove. The Kasco Ever Soft glove has been treated to remain soft and supple for its entire lift span -- through the sweat, the rain, the dirt, and being stuffed in your bag in a crumpled-up wad at the end of your round. In my experience, a golf glove is either a very personal item -- treated with reverence and respect -- or just another crutch golfers use when a shot goes awry. To get the most from your Kasco Ever Soft golf glove (or any golf glove for that matter), lay it out flat when done for the day and allow it to dry out naturally and slowly. Washing the glove is rarely a good idea as it can remove the treatment that will help to keep it soft. supple and usable, round after round. The Kasco Ever Soft glove is available in the always popular white leather and includes a "button style" ball-marker typically found on golf gloves.